This review falls back in the year 2015, my first visit of an OpenStack Summit in Tokyo. I recognized how cool would be to have a OpenStack Summit in Germany, especially in Berlin area, where I live. Just around this time (2015/2016) the OpenStack Foundations sent out a Call for Venue, so I proposed Berlin ICC as the convention area. Unfortunatelly that building was closed and Messe Berlin starts with construction of the CityCube. Now, in 2018, the OpenStack Summit is gone, just 2 days before as the last OpenStack Summit which will we ever haved. The OpenInfrastructure Summit was born here and the first one will be held in Denver (US) April/May 2019. The OpenStack Foundation announce it one year before where the next Summit will be held. So it was nearly in the middle of 2017 when I started with brainstorming: how can we make that Summit very special and uniq. The OpenStack community in Germany is mostly gone with the hype cycle in 2015. Nevertheless we have companys with business behind OpenStack. B1-Systems is one of them with offerings for consulting and training around OpenStack. Deutsche Telekom is active in many areas. As an early bird the Telekom Innovation Laboratories adopted OpenStack 2012 to a production platform. Hubraum was forked as a tech incubator and is together located in Berlin Schoeneberg, Winterfeldtstrasse 21. It was the best place for our Edge Computing Hackathon, which I planned the weekend before the Summit together with a colleague. 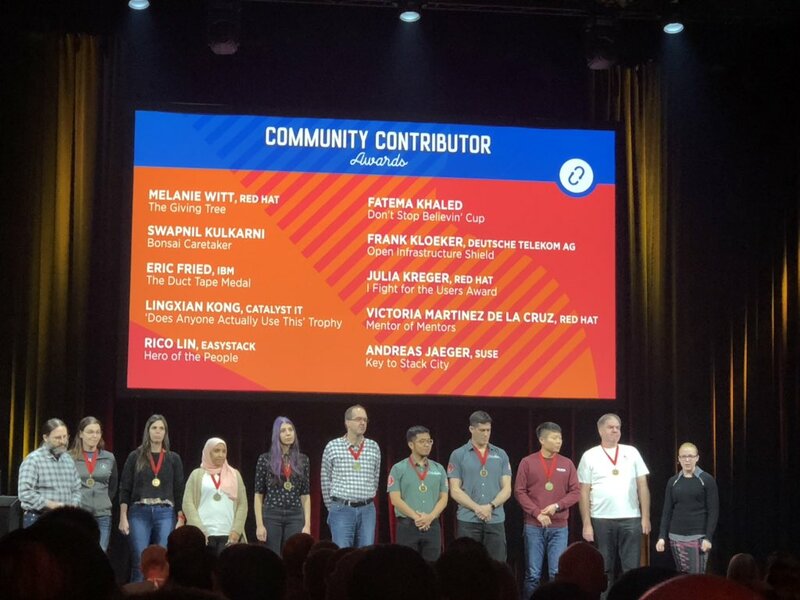 The OpenStack Edge Computing Working Group, headed by Ildiko Vancsa, helped a lot to get the content for the Hackathon and to bring brand new projects like StarlingX within. At the end we had two days of fun and connected people in about 6 teams with very different projects, all under the umbrella of Edge and connected devices. Some of the winners were able to join the Berlin Summit with a free ticket or the next Summit in Denver. The Monday, 12 November, could be a day off before the Summit starts on Tuesday. Not so here. The idea was to make an internal DT event named Cloud Camp, because most of the people are already in town. At the end not so many people have appeared at the Deutsche Telekom Representatives Office in Berlin, Franzoesische Strasse. But I organized the OpenStack Directors Board Meeting as a co-located event. The meeting space was separeted, of course, but the attendees of both mixed up during lunch and the Get Together in the evening. What I heart as feedback, the building with 140 years of history in the middle of the city has made a lasting impression. After that the week could be over. Nevertheless the OpenStack Summit started on Tuesday. I was a bit nervous what the people would expect. The CityCube is too small for all the breakout sessions, so the OpenStack Foundation rent Hall 7 for additional space. Some rooms were so far away, so only few people found it. On the other side sessions around container and Kubernetes are completly over-crowded. There are also no bigger hotels around the venue. We had only the back view of the Avus tribune and the wood Grunewald. On the north of Berlin Messe is the Funkturm located, a tv-tower, copied from the Eiffel Tower in Paris. To glowing that in the evening in red as the special OpenStack color was also a small idea what I stressed the Foundation staff in advance. Beside the limitations of the venue, public transportation was a long +1 lane on the feedback session on Thursday. And I was suprised on Twitter that people found some quaintly restaurants what I never heart before. To make the city of Berlin a little more known, I grabbed the idea of the Pub Crawl which was held during the OpenStack Day in Krakow in this summer. A funny thing to visit different pubs in the city to receive a special food or drink. If I remember in Krakow we had 4 stations to catch with around 100 attendees. That should scale up to 1000 in Berlin, but it was a hard work to convince the bar owner to be a part of our event. Most of them in the tourist area are almost full and at the end it was very over-crowded but also a funny event around Savignyplatz in City West and Alexanderplatz in Mitte. Of course, most of the project teams want to have their own dinner, but we have had only 3 nights to place that. First night is the Marketplace Mixer as usual and Thursday lots of people leave the city, especially if you only have a business trip. The Docs&I18n team met on Thursday in the restaurant Scheune for a team dinner and end up of the Summit, because we won the last session track for the Project Onboarding. In between I can't talk so much. My name was listed two times on the screen. At first I donated to the Travel Support Program. My travel costs tended to zero for that Summit with the office over the street. The second thing was much bigger: I won the Contributor Award . Curiously as Open Infrastructure Shield, but all that mentioned things in the encomium are true. It's a confirmation of the work in the community. And a good example to contribute without Lines of Code (LoC) as metric. This gives the opportunity to read afterwards and also other people who are interested can step in. Most interesting things are the revitalization of Trove with the guys from Samsung R&D Poland and the work of Operators community to get then closer to the Developer. I see the next task in the horizon (organizing Ops meetup in Europe and an OpenStack Day in Germany). Before I leave to vacation some words about I18n. Indeed, I spent some time this summer to spread the knowledge about the OpenStack I18n project in Europe. Just in time we finished the Proof of Concept for Project Doc Translations and the documentation of the well known project OpenStack Ansible is now also in German available. A lots of people from Australia attended the Berlin Summit and maybe as you know, our translation platform Zanata was developed by a RedHat team in Australia. That project is gone and the task of the next PTL is to think about the issue how to get a maintained translation platform. But also here is possibly thanks to the community a solution. I showed my vision in one slide at a previous event and now I met people with the same view (bring AI in practice). That's what makes a community. This entry was posted by eumel and is filed under openstack.